The international intracranial pressure monitors market is experiencing a shift to non-invasive ones from invasive devices, as demands of patients have changed, says Transparency Market Research (TMR) in its latest market research report. Manufacturers of intracranial pressure monitors within this industry are facing stiff competition and this is further compelling them to stay up dated offering their customers with the latest of all devices. Thus, much of the emphasis is given to technological advancements and research and development. Some of the leading market players in the intracranial pressure monitors market comprise names such as Codman & Shurtleff Inc., Integra LifeSciences Corp., and Medtronic Inc. These market players are aggressively integrating advanced technologies into their products and making efforts to introduce next-generation gadgets in the market. This report further adds that by entering into strategic partnerships with various local players, the market players are estimated to gain more shares in the market. 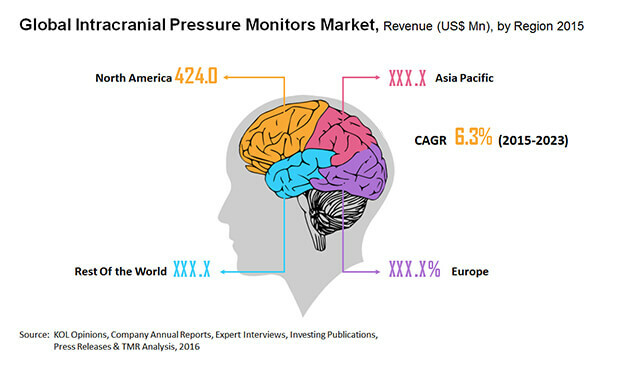 In accordance with the report by TMR, it has been estimated that the world market for intracranial pressure monitors would be worth around US$ 1.63 bn by the year 2023. The international market for intracranial pressure monitors stretches across the geographies of North America, Asia Pacific, Europe, and the Rest of the World. The region of North America has emerged as the one of the largest contributors to the intracranial monitor consumption since the last few years. Though North America has been forecasted to remain the leading regional segment for the global market for intracranial pressure monitors over the period of forecast, however, the region of Asia Pacific is estimated to make an offering of a very profitable opportunities to market players, on account of the presence of a large number of untapped markets. The world market for intracranial pressure monitors is driven by the rising frequency of traumatic injuries due to frenzied and hectic lifestyle of the people across the globe. This has also led to the high occurrence of strokes, thereby bolstering the demand for intracranial pressure monitors. A soaring number of people who suffer from high blood pressure, which is responsible for augmenting the rate of strokes and propelling the requirement for intracranial pressure monitors. Cranial injuries are happening quite frequently and so are head traumas owing to various road accidents and industrial accidents. An analyst of the report has discovered the untapped markets in many of the developing nations so as to offer attractive growth opportunities in the years to come. While, on the other hand, the reports about cerebrospinal fluid infection, which could even result in fatal outcomes are expected to limit the application of intracranial pressure monitors, thereby posing a challenge for the growth of the market.